A federal judge will hear arguments next week in a legal challenge to Mississippi's decade-old ban on gay marriage. U.S. District Judge Carlton Reeves will hear arguments in the case on Wednesday at 9 AM. 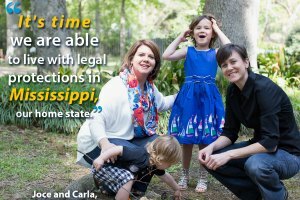 The Campaign for Southern Equality (CSE) filed the lawsuit last month on behalf of Andrea Sanders and Rebecca Bickett, who wish to marry in Mississippi, and Jocelyn Pritchett and Carla Webb, who want their marriage celebrated in Maine to be recognized by Mississippi. Lead counsel for the plaintiffs is Roberta Kaplan, who also led the legal team in the landmark Supreme Court Windsor decision that struck down a critical provision of the Defense of Marriage Act (DOMA) last year. Windsor has played a significant role in cases challenging state marriage bans. Rev. Jasmine Beach-Ferrara, executive director of CSE, said in a statement that the issue was critical for gay couples in Mississippi, 26 percent of whom are raising children, according to figures published by the Williams Institute. “Equality cannot come quickly enough to Mississippi for these families,” said Beach-Ferrara.